For as long as we’ve known it, Fethiye’s Karagözler has always managed to play host to a happy mix of local dwellings (lots of them are very swanky local dwellings, too, we might add), small hotels of the more luxurious variety, mid-priced hotels and backpacker hostels where travellers happily share budget multi-bed dorms with other like-minded wanderers. And now, the Karagözler has a very welcome new addition to the hostel tally – apart form the fact that it adds more budget beds to the town centre, this place is also a pub! Welcome to Fethiye, El Camino Hostel & Pub. It’s the pub bit we’re concentrating on in this post because we’ve been up there a few times now and it’s a great place – young, chilled and friendly atmosphere, decent food and fabulous views over the bay of Fethiye. 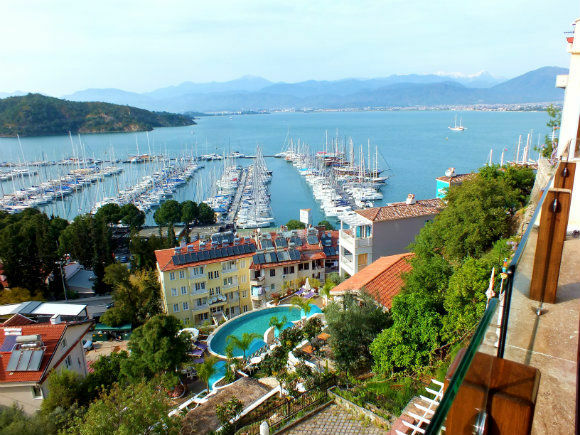 The views of Fethiye from this terrace bar – not too bad, are they? Amongst Fethiyeli (people from Fethiye) El Camino Hostel & Pub is arguably the town’s worst kept secret. Most of our Turkish friends have either been there or have talked about their intention of going there sometime soon. We first saw a photo of the view from there on Instagram, taken by a guy we know. As I was scrolling through photo after photo in our feed one morning, I stopped dead on his photo. As it’s a hostel, too, we thought the bar might be quiet; perhaps just a place for guests to mingle. Well, we thought wrong. It’s only a small bar but it was packed. Fortunately, someone was leaving as we arrived so we managed to bag ourselves a seat right on the edge of the terrace, overlooking town. Some of the foods on offer at El Camino. You can’t beat homemade köfte! But it’s not just about the food, coming to El Camino Hostel & Pub. We just like the atmosphere and the young energy. It’s got a happy feeling – and it’s also got a map of the world made from beer bottle tops at the entrance. We love that. Good effort! And when you do arrive at the doorway of El Camino, slightly out of puff from your climb, and you head through the bar and across to that oh-I-can-never-get-bored-of-looking-at-this view; sitting at a table and having that first freezing cold beer placed before you – oh, how much do we enjoy that beer! To get there, head up the steep hill facing Yacht Boutique Hotel, following the bend to the right – then take a left after you’ve passed Ideal Pension. The entrance to El Camino is on your left after about 50 metres. You can get more info, photos, updates etc by liking the El Camino Hostel & Pub Facebook page. Click into our page for more ideas about where to eat and drink when you’re in the Fethiye area. I’m going to start using your posts as menu inspirations. I like the sound of kofte on cheese and aubergine. We really are köfte freaks, BacktoBodrum. So difficult not to order it from the menu when we see it – it’s staple where you can make a decent judgement of what the rest of the food might be like. If they can do a good köfte… 🙂 We love to make our own, too.